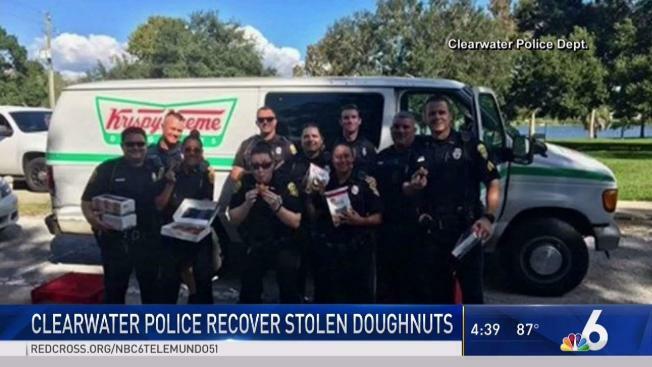 It was a lucky day for some Florida police officers who recovered a stolen van filled with Krispy Kreme doughnuts. Clearwater police posted a photo on Facebook of a group of officers standing in front of the van holding boxes of the tasty treats. It was a lucky day for some Florida police officers who recovered a stolen van filled with Krispy Kreme doughnuts. The Clearwater Police Department posted a photo on Facebook of a group of officers standing in front of the van holding boxes of the tasty treats. Clearwater police said the van was reported stolen Tuesday morning in Lake City, which is 193 miles north of Clearwater. It was spotted, loaded with doughnuts, at Crest Lake Park Tuesday afternoon. The Facebook posting says the store manager donated the cargo of "delicious" doughnuts to the officers. They saved some doughnuts to eat and handed out the rest to the area's homeless. Authorities are still looking for the van thief.